This is one of those recipes came up by adding what's in my fridge to new stuff I wanted to eat. 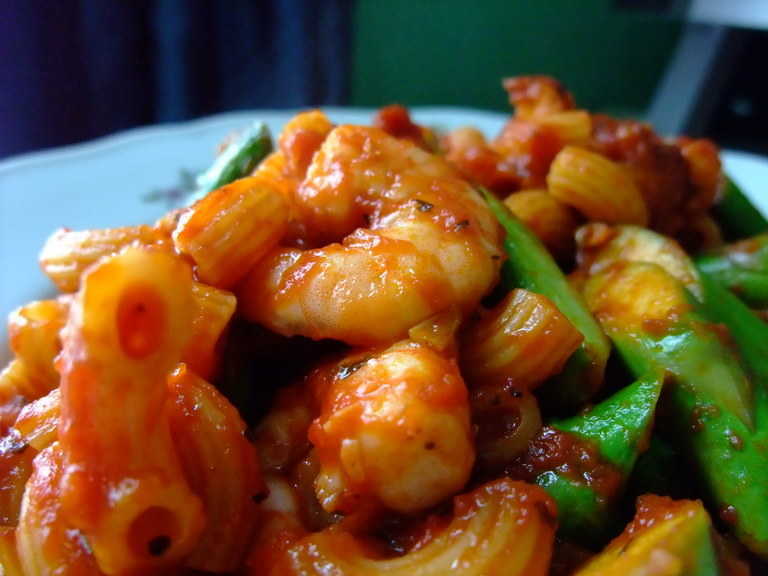 I had prawn and some juicy and fat looking asparagus plus I had some tomato sauce hanging out in my fridge begging to be used. I also had some Mongolian vodka leftover from my travels that no one dared to drink because it wasn't Grey Goose. Bah. So a lot of it went into this recipe. You can leave out the chilli if you're not a chilli fiend like me. I keep a little freezer bag full of chopped chilli padi (the little but lethal ones) and hack off bits of it as I need. Only had macaroni in my kitchen, so no penne, even though I think penne is probably the best match pasta for this recipe. Melt butter over medium and add garlic and shallot. Saute gently till translucent. Just before garlic and shallot brown, add tomato sauce and vodka. Stir and add a bit of water if it's too thick to coat your pasta, then add chilli. Add asparagus and cook for about a minute, then add prawns and stir till almost done. Add pasta, then check seasoning and devour.